John Allen Day, 93, of Savoy, passed away peacefully in his sleep at 10:15 am on Monday, November 26, 2018. He was born in Urbana on July 6, 1925, a son of Daniel D. Day and Julia (Walters) Day. He married his sweetheart, Leona Myrul Carrier, on November 23, 1946. Prior to their marriage, John joined the U.S. Navy. 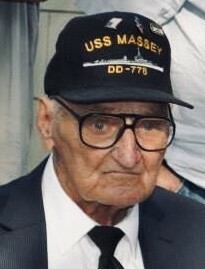 He served as a torpedoman in WWII aboard the U.S.S. Massey and U.S.S. Remey from 1943 to 1945. Back home in Illinois, he became a carpenter and built many homes and apartment buildings in the area. He continued to work in the trade for 50 years. He was well-known and highly respected in Central Illinois for his exceptional carpentry skills. He built the family home in Savoy in 1955. There, he and Leona raised their four girls. For many years, he served the Village of Savoy as a volunteer firefighter, building inspector, and was a member of the Methodist Church. He was also a proud member of the VFW in Urbana. After he retired for the third time, he and Leona moved to Oakland, Illinois. There, he enjoyed fishing, playing cards and dominoes with family and friends, and hosting many family gatherings. He was the cornerstone of his family and loved being surrounded by them. Surviving are his daughters, Alice Hughes (John) of Savoy, Phyllis Riggs (Randy) of Urbana, Virginia Pruitt of Homer, and Susan Hammersmith (Terry) of Sadorus. He is also survived by a brother, Wilfred Day of Florida, eleven grandchildren, sixteen great-grandchildren, and eight great-great grandchildren. He was preceded in death by his wife, parents, five brothers, and four sisters. John did not wish to have a funeral or visitation, therefore a celebration of life will be held at a later date.